Sometimes you get on the airplane and you just want people to leave you alone. You don’t want to talk to your neighbor, you want to either listen to your iPod or play a game on your phone. We all feel like that at times, especially when traveling alone. I view my time on the plane as my time and I like to use it to read a book, do a crossword or write a blog post. In short, I like to focus on a “me” activity. I’m cool with talking to my seatmates, but I don’t want to chat with them for the whole flight usually. We’ve all had that chatty neighbor who wants to tell you their whole life story and doesn’t take the hint, even when you are clearly trying to take a nap or hide behind a magazine. HoodiePillow might just help get your point across, while also making you comfortable. 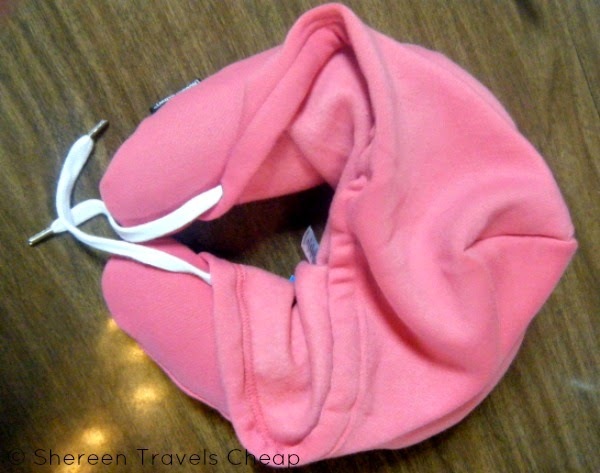 HoodiePillow combines your two favorite things: a soft, comfy hoodie and a neck pillow to help you sleep without waking up all stiff and achy. It features a drawstring, so you can pull it tight and block out light, or keep it loose, just so you can cover your head. It won’t get in your way if you want to use your big headphones and, since it’s only one piece, it’s easier to use and less cumbersome than a full hoodie and separate neck pillow. Unlike many neck pillows, this one doesn’t take up a bunch of room in your bag, because it’s inflatable. You can adjust it to your own needs and it folds flat when you aren’t using it, making it a great space-friendly travel product. I often see people trying to attach their heavy, non-inflatable pillows to their bag in some way. They just get in the way and add weight to all the stuff you’re already carrying. I don’t need that. Got a partner who likes to turn on the vent when you’re on the plane? I do, and even though it’s his vent that’s directed at him, it somehow either freezes my shoulder or blows right in one of my eyes. I don’t want him to be uncomfortable, but if my eyes are glued shut from having air blowing in them for hours, I’m going to be very cranky. 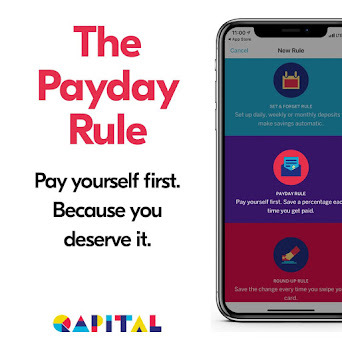 This is another great solution for us. 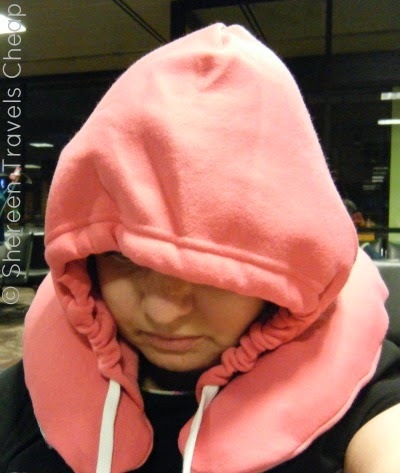 The HoodiePillow will protect my eyes and keep my head, ears, neck and shoulders warm when on those flights. 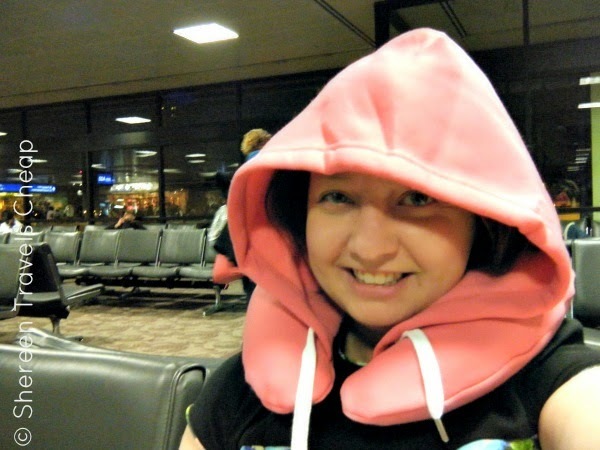 The HoodiePillow is a great gift for the teenager or college student who is never seen without a hoodie on. They can use this on the bus, on road trips, in hostels and plenty of other places. It fits over anything you’re wearing, without getting all bulky like wearing a full hoodie over anything else, especially when a hoodie doesn’t work with your travel outfit – really, they don’t go with everything. 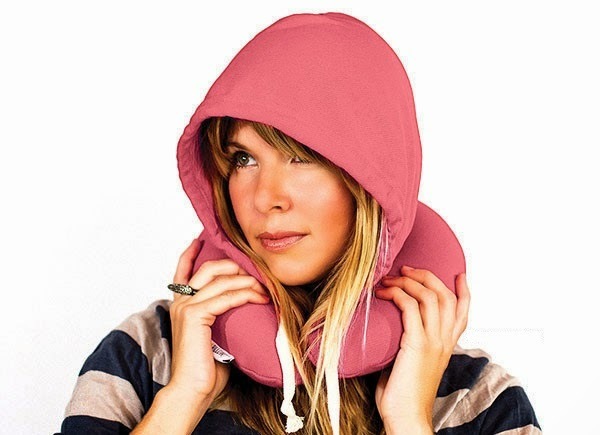 Sleep easy on planes even in the daytime, because the HoodiePillow can block out the light. It also protects your head from nasty germs that might be on the airplane seat headrest. Getting sick right when you start your vacation is the pits. 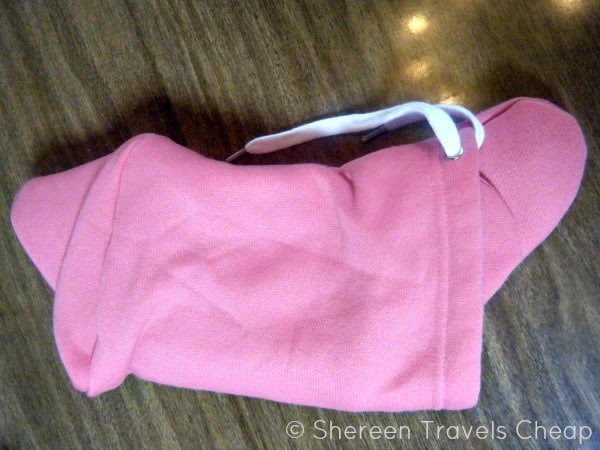 When you get home, or to your destination, the HoodiePillow is hand washable. Just let it air dry and it’s good to go next time you need it! I used this on my flight back from Phoenix, but since I’d had a long two days and was dead tired, the second I put it on and leaned back on the plane, I immediately fell asleep, so you only get a picture of me trying it on in the terminal before take-off. I woke up refreshed and my neck didn’t hurt, so I call it a success! My husband wants one now and I know several people in my circle of friends and family who would love to get this as a gift. Got a student on your gift list? Perhaps they are taking their year off to go backpacking through Europe, or just going on vacation this summer with you or their family. They are going to adore you for buying this for them. In fact, you may find they rarely take it off. The material is super soft, so I can’t blame them. How much is it? $19.95. Disclosure: I was provided with the HoodiePillow for the purpose of this review, but all opinions are 100% my own.